In addition to viruses, several drugs have been associated with the development of aseptic meningitis, most of them belonging to the group of nonsteroidal anti-inflammatory drugs (NSAIDs, mainly ibuprofen), antibiotics, immunosuppressants, and antiepileptic drugs. Although the pathophysiology of drug-induced meningitis (DIAM) remains obscure, hypersensitivity reactions seem implicated. A sizeable group of DIAM patients (50 % in cases of NSAID-related and 41 % in antibiotic-related meningitis) have an underlying process predisposing to meningitis development, most frequently systemic lupus erythematosus (SLE). 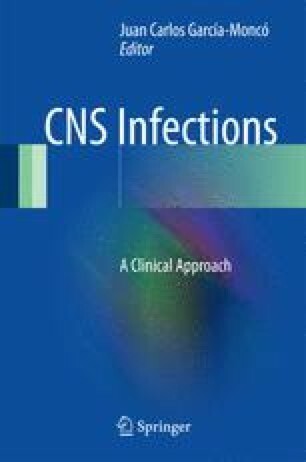 DIAM and infectious meningitis, including pyogenic meningitis, are indistinguishable based on clinical characteristics and cerebrospinal fluid analysis; thus, a thorough history on prior drug intake is key to avoid expensive diagnostic procedures or lengthy and unnecessary antibiotic treatments. Besides DIAM, several systemic and neurological disorders, including SLE, sarcoidosis, Behçet disease, Sjögren’s syndrome, and primary angiitis of the central nervous system may also mimic infectious meningitis, making the etiological diagnosis and management of these patients challenging.